Homeownership is all about making good decisions, good investments. You see, each and every home improvement project you undertake has a direct impact on the value of your home. But how do you determine which projects are the best investments, especially when it comes down to something as seemingly small as choosing wood decking or composite decking? The initial cost of a composite deck tends to be slightly higher than that of a traditional pressure-treated wood deck. According to Remodeling Magazine’s Cost vs. Value Report, a wood deck in Maryland carries an average return on investment of 78.6%, while a composite deck carries an average investment of 66.4%. The typical wood deck lasts between 10-15 years with regular maintenance, though decks in areas with less precipitation have been known to last 20-30 years. Composite decks, meanwhile, have a lifespan ranging from 25-50 years. Wood decks require annual maintenance: cleaning and staining. Composite decks, on the other hand, only require the occasional cleaning. They don’t call them low maintenance decks for nothing. These decks are built to stand up to the elements and maintain their aesthetic appeal with little to no maintenance. Low maintenance decks naturally resist weathering, warping, and bugs. Whether you enjoy hosting summer barbeques or just enjoy spending time with your family, a new deck, regardless of material, gives you the perfect venue for those special occasions. Now you can enjoy the great outdoors from the comfort of your very own deck. Add an awning to shield yourself from the rain and extend that usability even more. 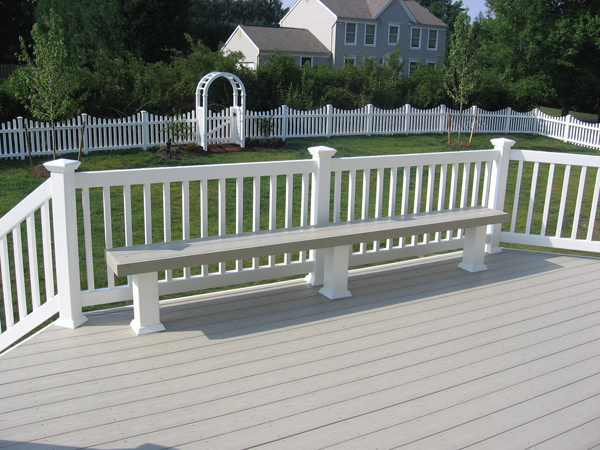 Mid- Atlantic Deck and Fence has been building custom fences and decks throughout Maryland since 1987. Today, we have one of the largest selections of low maintenance decking products in the state. We use a 3D deck design software program to give you a better idea of how your new deck will look on your home. This is just one of the many reasons that Mid-Atlantic Deck and Fence Co. is one of Maryland’s leading and most innovative deck and fence companies. If you have any questions about choosing wood or composite decking, please contact Mid Atlantic Deck & Fence (MAD Fence) today by clicking here or calling 1-800-833-9310. We proudly serve Anne Arundel, Baltimore, Howard, Montgomery and surrounding counties.